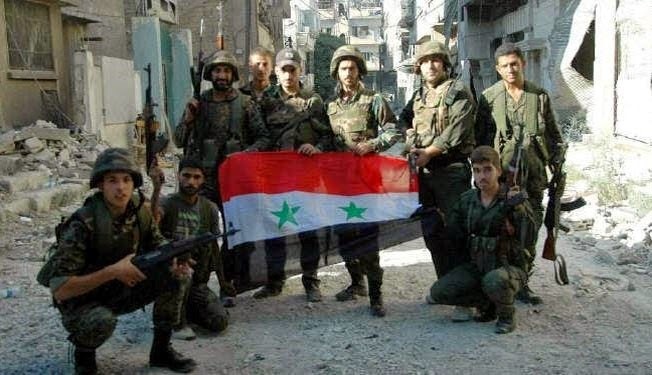 June 21, 2014 (Tony Cartalucci - NEO) - The government in Damascus and the Syrian Arab Army have begun restoring order across the country after over 3 years of devastating fighting. The so-called "capital of the revolution," the city of Homs, has been reclaimed by government forces and people have begun returning home. A recent election carried out across Syria and throughout expatriated Syrian communities around the world portrayed widespread support for the government in Damascus and more over, the idea of Syria as a nation itself. Defying expectations that he would be the next domino to fall in the Arab Spring's chute of regional dictators, Assad stands stronger than ever. His military, augmented by fighters from the Lebanon-based Shi'ite militia Hizballah, funded in part by Iran and armed with Russian weapons and ammunition, has consolidated control over a strategic corridor connecting the capital, Damascus, to the coast. 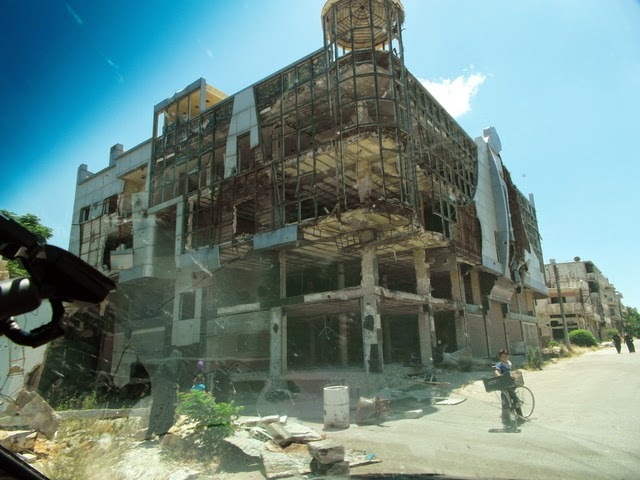 ...the war's toll has more and more Syrians turning, reluctantly, toward the regime. Not because they support Assad but because they are desperate to return to some semblance of normal life. For the rebel brigades and exiled opposition leaders, the involvement of extremist groups was an unfortunate stain on an otherwise pure uprising against tyranny. To the regime, it was proof of a foreign-funded scheme to destabilize Syria. The narrative, repeated across the Western media, illustrates how the US finishes up a lost war. First, it makes excuses as to why deviations from the West's original narrative have manifested themselves in demonstrable and undeniable events, like Syria's elections and the overwhelming support Damascus visibly commands across the country. Next it revises history to account for how and why events unfolded differently than expected. In Syria, the protracted warfare that eventually revealed Syria's "freedom fighters" to be armies of foreign-funded terrorists flowing over the nation's borders is explained as extremists "hijacking" or "derailing" the "revolution." Throughout the rest of Hersh's nine-page report, which came out 4 years before the so-called "Arab Spring" unfolded, is outlined in specific detail how the West and its regional allies including Israel and Saudi Arabia, were already funneling in cash and arraying armed sectarian extremists against Hezbollah inside of Lebanon and against the government of Syria. Hersh's report even included a retired CIA agent who portended the sectarian nature of the impending, regional conflict. The third and final step the US must take upon losing a war is to leave chaos where victory was denied, and attach responsibility for the conflict to a disposable elected politician - in this case US President Barack Obama. While the war was clearly conceived during the administration of George Bush as early as 2007, it was executed under the watch of Obama. By attaching responsibility for the conflict to Obama, when his term is up and he passes into the hindsight of history, corporate-financier funded policy makers will have before them a clean slate upon which to begin carrying out the next leg of their continuous agenda. For all his swaggering claims of victory, Assad presides over a country in a profound state of destruction and distress. The U.N. Relief and Works Agency estimates that even if the war were to end immediately, it would take 30 years for the economy to recover to pre-2010 levels -- and then only if GDP grew at a steady 5% a year. According to government statistics, prices of basic consumer goods like food and fuel have tripled. Half the workforce is jobless, and more than half the population is living in poverty. The United States might still arm the opposition even knowing they will probably never have sufficient power, on their own, to dislodge the Asad network. Washington might choose to do so simply in the belief that at least providing an oppressed people with some ability to resist their oppressors is better than doing nothing at all, even if the support provided has little chance of turning defeat into victory. Alternatively, the United States might calculate that it is still worthwhile to pin down the Asad regime and bleed it, keeping a regional adversary weak, while avoiding the costs of direct intervention. While in 2012 it was still too early to be sure, it is now without a shadow of a doubt this policy that the US and its regional partners have pursued in the last, losing stages of this conflict. TIME Magazine's sobering assessment of the destruction this policy wrought is the price Syrians have paid for Washington's desire to keep a "regional adversary weak." The insidious, premeditated nature of Syria's destabilization and destruction is a hard lesson learned for the Syrian people, and a lesson other nations around the world must learn from in order to prevent a similar scenario from unfolding within their borders. While the US may have lost its proxy war with Syria, the Syrian people's victory has come at a great cost. Ensuring those who paid in full for this victory did not die in vain, Syrians living today must work together to dash Washington's hopes that the West's parting shots will leave it "weak" for years to come.